What is an Air Source Heat Pump (ASHP)? Air source heat pumps are a type of ‘fit and forget’ technology that’s used to power heating systems within the home. 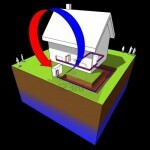 An air source heat pump is often placed at the back or side of a property, where it collects heat from the air. An air source heat pump is comparable, in looks and size, to a domestic air conditioning unit. There are two main types of Air source heat pumps, air-to-air and air-to-water. Air-to-water systems extract heat from the outside air transferring it into your wet central heating system. Air-to-air systems transfer heat collected from the outside into your home via fans. In the summer an air-to-air source heat pump can be operated in reverse, similar to an air conditioning system, so providing cooled air for your home. Air source heat pumps work by absorbing heat from the surrounding air into a refrigerant fluid within it. The heated fluid then passes through a compressor where the temperature is increased further. Finally the heat is used within radiators, underfloor heating, domestic hot water systems and even warm air convectors. 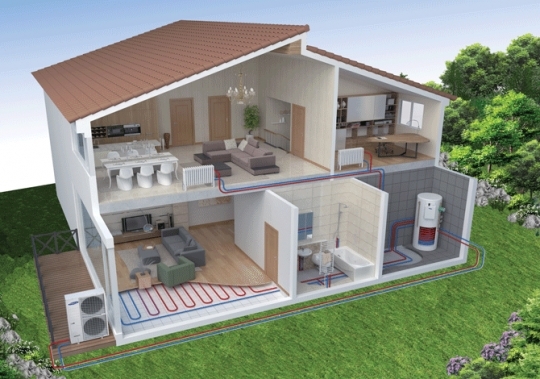 Air source heat pumps ‘collect’ heat from the air in the same way a domestic refrigerator does from its interior. Heat can be collected at temperatures as low as -15 degrees C but are most efficient above 5 degrees C.
What are the benefits of installing Air source heat pumps? Air source heat pumps provide hot water and heating. Savings of between £150 - £530 per annum are attainable. Lower carbon emissions than conventional heating systems. Cheaper than Ground source heat pumps and easier to install, especially when retrofitting. How Much Will I Save ? Air source heat pumps are estimated, by The Energy Saving Trust (EST), to save between £150 (replacing oil) and £530 (replacing electricity) a year. The government have estimated a payment of £500 a year through the Renewable Heating incentive (RHI) would be applicable also. The payback on the purchase of your Air source heat pump system would depend on how efficiently the system works, the system you are replacing and the uses of the heat generated by the pump. Can be used for air conditioning in warmer periods. Air source heat pumps are eligible for the Renewable Heat Incentive (RHI) premium payment (one off grant of £1300) until March 2014 and will be eligible for the full RHI in spring 2014. Thermodynamic panels UK is based in Surrey but installs air source heat pumps, ground source heat pumps thermodynamic panels and solar pv in all areas throughout the UK. We have recently installed air source heat pumps in London, Essex, Kent, Hampshire and Suffolk to name but a few. For installations by professionals look no further than Thermodynamic panels Uk, saving you money whatever the weather. We work with you to ensure that the right product is installed at your place of residence. We help you decide what is best for you and one of our expert installers will be there to help you every step of the way. Thermodynamic panels come in all shapes and sizes. We will happily show you through whats available. We will quote you for the product and the installation. You are under no obligation to purchase from us. When you are happy with your selection and quotation, one of our expects will come out and install your panels.